provided below, you can restrict your Agent-in-Fact to deal with a specific matter only such as the buying or selling of a motorcycle (for example) on your behalf. Note: This limited power of attorney form can be used as sample document for any transaction by simply changing the item details and description. You can set a time limit (such as thirty days) for the document to remain in effect, after which it automatically expires. If you want to cancel the specific power of attorney before the date stipulated, you need to issue a revocation. Visit our Motorcycles Page for additional information and links to related legal documents. 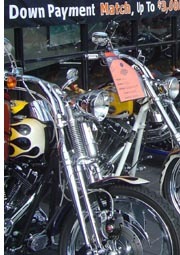 Enter into a sales agreement for the selling of the motorcycle as identified below. The sum of ______________ as instructed by me. The best price according to his/her judgment but limited to _____________. Enter into a sales agreement for the purchase of the motorcycle as identified below.